It's so amazing to rediscover the world through a child's eyes. 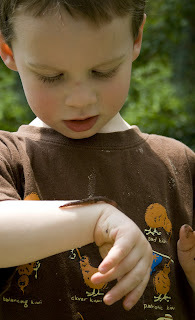 My youngest son spent the afternoon getting reacquainted with worms. This is the child who I caught eating worms last summer but has always refused to eat spaghetti. Well now that he's a year older and wiser he's given up adding them into his diet and instead is completely fascinated by the worms. I snapped a few pictures while he let a worm wiggle in his hands. Who needs the latest, greatest, made in china toy when you have a yard full of creepy crawlers.